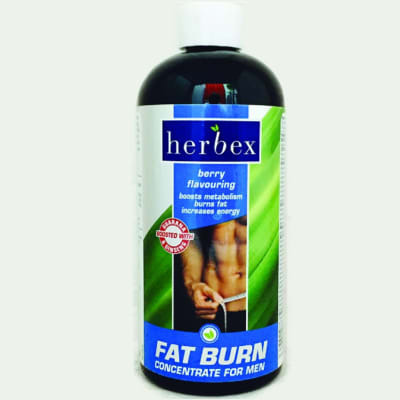 A herbal food supplement traditionally used as cardiac tonic that aids peripheral circulation, regular heart rate and blood flow. Ideal for the elderly and busy executives. Ingredients: Hawthorn(Crataegus laevigata) Tableting ingredients: Dicalciuum phosphate, DC PVP VA 64, microcrystalline cellulose, magnesium stearate. 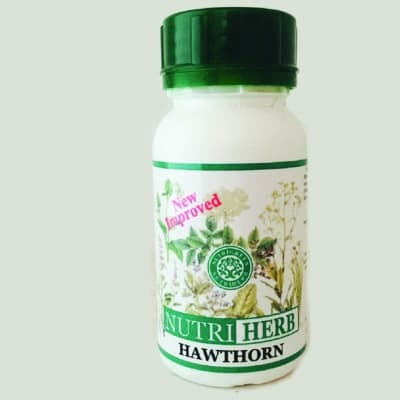 A beneficial herbal food supplement traditionally used as: Cardiac tonic which also aids: Peripheral circulation Regular heart rate Blood flow Tonic for the elderly and busy executives under work pressure and stress. Useful for the nervous conditions, particularly insomnia. Dosage 1 Tablet 2-3 times daily with water before meals or as recommended by health care professional. Free of: Artificial preservatives , flavourings, colorants, added starch, sugar, lactose, gluten, wheat, yeast, salt, animal or dairy products. Suitable for: Vegetarians, Vegan, Kosher & Halal diets. Other information Not significant source of protein, carbohydrates, fats and cholesterol. Not recommended for children and pregnant women. Cardiovascular health support. Provides muscular energy needed for cell growth and maintenance. Protects the body from damage caused by harmful molecules. 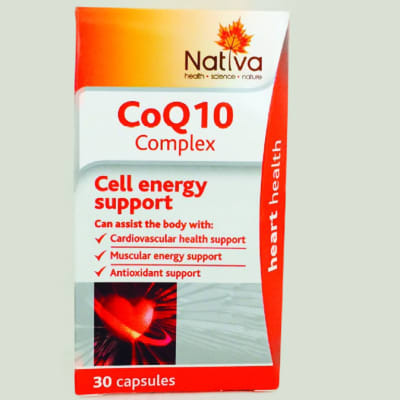 Nativa CoQ10 Complex is a supplement to support optimal absorption of coenzyme Q10. Benefits Cell energy support Cardiovascular health support Muscular energy support Antioxidant support Relief of muscle cramps associated with CoQ10 depletion Ingredients and Benefits Active Ingredients:	Per 2 capsules:	%RDA# per capsule (maximum daily dosage): Ubiquinone (Coenzyme Q10)	150 mg	* Vitamin E	10 mg (14 IU)	100% CoQ10 can assist the body: With cardiovascular health-, cell energy- and antioxidant support. To relieve side effects from statin medication associated with coenzyme Q10 depletion, such as muscle cramps. To maintain cardiovascular health and normal heart function. With blood pressure and circulatory support. Vitamin E can assist the body: To improve the bioavailability of coenzyme Q10. Note: This medicine is not intended to diagnose, treat, cure or prevent any disease. Dosage Adults and children 12 years and older Take one capsule daily, after a meal, with a glass of water. Other Information Do not use if hypersensitivity or allergy exists towards any of the ingredients. People using anticoagulant- or Antiplatelet medication, such as Warfarin, should use this product with caution, as ubiquinone (coenzyme Q10) and vitamin E may have a blood thinning effect.